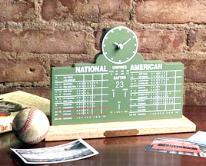 Click here to visit the Brooklyn Dodgers Gift Mall !! 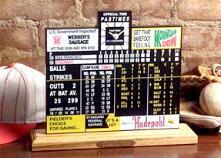 Pastimes Scoreboards and Dugout Memories Inc. 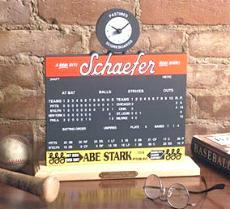 The Ebbets Field Schaefer scoreboard clock features the last game played at Ebbets Field on September 24, 1957 as it appeared that day. Scores from other games are depicted on scoreboard from photo taken that day. Danny McDevitt beats the Pittsburgh Pirates 2-0 in the last game. 6,702 fans watch the last rites. 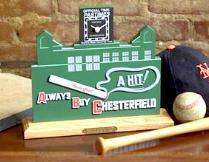 Wood base and scoreboard with clock mechanism made of metal casing for 1-AA batteries which are included. Dimensions: 11" x 13"-with date inscription at the base. Crosley Field is the only major league ballpark to be brought back to life, and it happened twice, in two different states. When parts of Crosley were auctioned off in 1970 , Larry Leubbers, a life long Reds fan, went to buy two seats as souvenirs, but, he said, "I got carried away....Before I knew it, I had the walls and the scoreboard too." Over a two-year period, he had the 65- foot scoreboard repainted and rebuilt the 60-foot flagpole after it cracked into three pieces, then proceeded to saw the ticket office in half so that it could be moved across an Ohio River bridge and nailed back together. The last game at Crosley was on June 24, 1970. Dimensions: 10-3/8" x 9-1/4"--with date inscription at base. The date ( October 3, 1951) and scoreboard display with scores from around the league marks the date Bobby Thomson hit his famous homerun to beat the Brooklyn Dodgers and win the NL pennant. The park was ideal for left-handed pull hitters and the greatest of them all--Babe Ruth--loved it. The Giants played their last home game at the Polo Grounds on September 29, 1957. It was demolished in 1964 with the same wrecking ball that knocked down Ebbets Field. the New York Mets played their first 2 years at the Polo grounds before moving into Shea Stadium. Dimensions: 10-3/4" x 9-1/4"--with date inscription at the base. July 4, 1939 -It wasn't the holiday double header against the Senators that the 61,808 spectators came for. It was Lou Gehrig Day and the fans showed up to pay tribute to the man they called the Iron Horse. He had played in 2,130 straight games starting in 1925. He hit more grand slams than anyone before or since (23), and although he was only 34 at the time he was dying, that day Lou delivered what has been called "the Gettysburg Address" of baseball, "Today...I consider myself...the luckiest man...on the face of the Earth." In the 1950's, Forbes Field rapidly began to go downhill; one sportswriter called it " as joyless as a prison exercise yard." The Pirates played their last game at Forbes on June 28, 1970, two days short of its sixty-first birthday. Some seats were donated to the Cy Young Museum in Toledo. Sections of the ivy-covered outfield wall have been preserved, and a plaque marks the spot where Bill Mazeroski's homer ended the 1960 World Series. Dimensions: 10-5/16" x 7-1/4"--with date inscription at the base. Weegham Field is now known as Wrigley Field in 1914 and opens as home of the Federal Leagues Chicago Whales. The first official night game at Wrigley Filed is played on August 9, the Mets vs Cubs. Dimensions: 11" x 9"--with date inscription at the base. April 17, 1945 - One armed outfielder Pete Gray makes his major league debut. He goes 1 for 4. During the 7th game of the World Series 1946 Enos Slaughter's "mad dash" from first base scored the winning run on Harry Walker's base hit. Browns owner and showman Bill Veeck has 3 foot 7 inch Eddie Gaedel pinch hit. He walked on four straight pitches. Dimensions: 6-1/2" x 11"--with date inscription at the base.